Chamaedorea seifrizii known as Bamboo Palm or Reed Palm is a relatively small graceful palm that grows to about 7 feet tall as it forms clumps from runners. 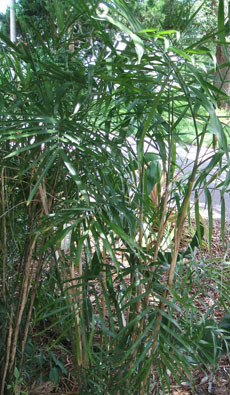 Each stem is long and thin with "nodes" very similar in appearance to Bamboo. The slender stems have about 10-15 fronds each with about 12 dark green pinnate leaflets. The flowers arise from the leaf sheaths or covering and are dull yellow in color. The fruits are usually small pea-sized berries that are orange/red in color. Caution should be used with the fruit, however, as it is an irritant to humans. As the old fronds turn brown, they should be trimmed off and the leaf bases or sheaths allowed to dry out on the stems. Later these should be removed to expose the attractive light green "bamboo" stem. This palm does well in zones 10 - 12 and is hardy to 26 degrees F. It is native to Mexico and Central America where it thrives as an understory palm. Today this palm is very common as a house plant and it is used in malls, offices and other business settings. It thrives in low indoor light but can tolerate some sunlight outside if acclimated. Keep it evenly moist but not wet. Propagate by division of the rooted suckers from the parent plant, or by seed which takes 6 months or more to germinate. This is a very popular, easily found palm.